Lagan Concrete Ltd, formerly Healy Bros, has firmly established itself as the leading supplier of concrete products in the greater Cork region. Part of the Lagan Group, which has been synonymous with the Irish building and quarrying sectors for over 50 years, the company’s range of products includes readymix concrete, limestone aggregates, concrete blocks and agricultural lime. After nearly four years trading as Healy Bros, the company was rebranded as Lagan Concrete in November 2013 and is committed to growing its footprint in the Munster region. Already, Lagan Concrete has expanded its customer-base in Cork and in the surrounding counties of Waterford and Tipperary. 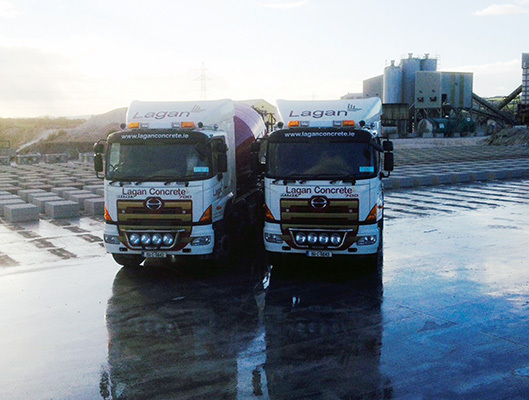 Lagan Concrete’s headquarters are located in Milebush, Mildeton, while it also has depots in Coppeen, Clashmore and Glanworth. A total of 24 people are employed between the four plants. The plant in Milebush is one of the largest and most modern of its kind, having the capacity to produce 100m of concrete per hour. Also located onsite are a fully automated block production machine and a block bander, both of which are Finlay. In addition, Lagan operates a range of Kleemann Reiner and Tesab crushers and uses Volvo loading shovels. The company runs a fleet of eight readymix trucks which comprise Hino, DAF and Renault. Lagan recently took delivery of two new Hino 700 series trucks from J Harris Assemblers in Dublin. They also sub-contract work to between 12 and 15 local haulage contractors. “We are very happy with how the new Hinos are performing,” says Lagan Concrete’s Operations Manager David Swanton. As well as supplying concrete products to a wide range of customers throughout Munster, Lagan Concrete is currently involved in two major construction projects which are being undertaken in Co. Cork by BAM Contractors. One is Dairygold’s €120 million expansion in Mallow, while the other is the €50 million Albert Quay development in Cork city. Lagan Concrete’s Business Manager is the former GAA star Declan Carr, who captained Tipperary to an All-Ireland hurling title in 1991. Lagan Concrete supplies the residential, commercial and agricultural sectors with a variety of readymix products, all of which are produced using quarried limestone. Standard mixes are available in the following strength classes: 10N, 15N, 20N, 25N, 30N, 35N, 40N and 50N. All mixes can be supplied with 20mm or 14mm aggregate stone. Lagan specialises in the provision of custom loads and mixes. A full range of admixtures is available, including water reducing agents, accelerators, retarders, plasticisers and air-entraining agents. These specialist additives provide a number of benefit effects to the concrete by increasing strength and durability, reducing or increasing setting time. Fibre reinforced concrete is also available. All concrete is delivered by the aforementioned fleet of modern trucks, a number of which are fitted with conveyor belts. An onsite technical laboratory ensures that all products are of the highest quality. Milebush is a fully accredited IS EN206 Standard facility. At the same facility, limestone is quarried and crushed to produce a range of quality aggregates. The following aggregate types are available for collection or delivery: half inch down, 3 inch down, 1 inch to 5 inch stone, Clause 804, 8mm stone, 14mm stone and 20mm stone. Concrete blocks are produced to the highest quality and standard using limestone aggregates sourced from Lagan’s quarry. The onsite technician and laboratory are constantly testing the blocks to ensure that the reliability, strength and quality are consistently maintained. A wide range of concrete blocks are supplied, from the standard 4” block to soaps, pads, bricks and specials. The other product offered by Lagan Concrete is agricultural lime. The lime is quarried in Milebush from limestone rock that is naturally well balanced with up to 94 per cent calcium carbonate and up to 3.4 per cent magnesium carbonate. This balance ensures optimum plant and animal nutrition. Lagan Lime corrects problems caused by excessive acidity which in turn improves availability of essential nutrients, reduces AI and other metal toxicities, improves soil physical condition and stimulates microbial activity. Approved by the Department of Agriculture, Food and The Marine, Lagan Lime encourages mirco-organisms in the soil and provides a valuable source of calcium which is vital to both soil and animal health. Lagan Concrete Ltd takes the health and safety of all employees, contractors and visitors to its sites very seriously. It is not only a priority, but a deep-seeded value. The company’s health and safety vision is that “zero harm should come to all our employees and visitors”. Since any vision is only as good as the working culture supporting it, management at Lagan Concrete and the wider Lagan Cement Group are committed to reinforcing and maintaining a proactive and positive safety culture at all times. The Group has a dedicated Safety Manager who works with Lagan Concrete’s management and staff to ensure that its safety culture remains a primary focus. The company has received a number of safety awards in recent years which are a great source of pride for all employees. Lagan Concrete is also committed to continually improving its environmental performance. To this end, a range of policies and procedures are adhered to, including the company’s Environmental and Good Neighbours policies. In November 2012, Lagan Concrete was accredited with the ISO14001 International Environmental Standard. This was the first major International Standard achieved by the company, which continues to go from strength to strength.